7:30pm classes will occur as normal based on our regular schedule. Monday-Crossfit, Tuesday-Olift, Wednesday-Gymnastics, Thursday-Olift, Friday-Crossfit. Please remember that the upcoming week of classes is available beginning NOON (12pm) on Sunday. You may sign up for classes on Monday-Sunday at that time. If you sign up for classes beyond the following Sunday, you will be removed from those classes and will need to re-register at the appropriate time in order to secure your spot. 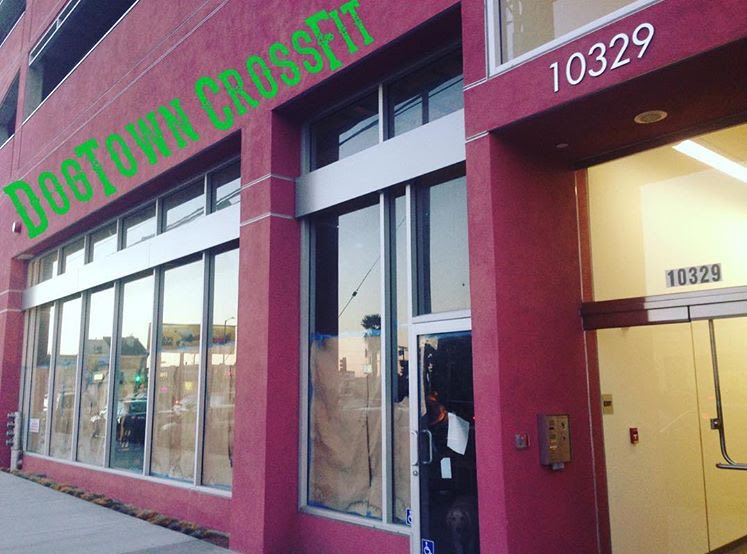 The link for access is www.dogtowncrossfit.frontdeskhq.com. Use the same steps to remove yourself from a class. You may sign up for classes for the coming week (Monday-Sunday) beginning at 12p on Sunday. If you register for classes beyond the week, you will be removed and will need to sign up again on the appropriate Sunday. Once you are signed up for a class the coach will confirm your attendance once you arrive. Please keep in mind that our bathrooms are not working right now. This is especially important in the AM classes. Arrive prepared for this. Also, don't forget to bring water with you. Every membership plan has a selected term. ALL cancellations require a minimum 30-day notice emailed to Kelly at kelly@dogtowncrossfit.com. An Early Cancellation Fee also applies to ALL membership levels and lengths of term (except Unlimited Month-to-Month). This fee is equivalent to a minimum of $50 per month remaining on your membership term. Please direct any questions about membership, signing up for classes, temporary schedule, new space, parking, etc to Kelly at kelly@dogtowncrossfit.com. We are officially out of our old space. The move is in progress. We hit some snags that were completely out of our control. Many of you have been enjoying the outside workouts at the Baldwin Hill Stairs over the past week. We know it’s not the same and an amended schedule by comparison, but we’re doing what we can to keep you guys moving and sweating! We will be having a limited schedule for a short while longer (see more info below). We wish we could be more specific on times, but we will continue to update you through social media as things settle. Due to the unforeseen hold ups, we will be issuing a partial refund to every member with a Platinum level membership (unlimited classes). Members with a limited class amount will not lose any of their classes for the month of October. Though one week has passed, those classes are still available until October 31st. Feel free to come in on extra days to take advantage of those remaining classes. In addition to the limited schedule, clients wishing to do their private or accessory programming must contact Dusty via email (dusty@dogtowncrossfit.com) to see if there is any available time/space. We will add more classes back in as soon as we can! Say hello to our new home! Our new space is at the corner of Motor Ave and Palms Blvd., across the street from Palms Elementary School, and approximately 2 miles from our old space on La Cienega Blvd. If you’re in need of a caffeine fix check out our new neighborhood coffee shop, The Commissary. It is across the street on Motor Ave. There is garage parking available. The ramp to the parking structure is in the alley just NE of the intersection of Motor and Palms. Be aware the second level is for the upstairs tenants. There is a second gate. It is usually closed, but just in case don’t go in even if its open or you are likely to get locked in. There is also street parking available on both Motor Ave and Palms Blvd. Be sure to check the signs as much of the street parking on Motor Ave is 1 hour. As a client it is your responsibility to sign in to class. As of October 1, 2015, every class now has a cap. However, you can now sign up for your classes ahead of time! You may also access your Front Desk account to sign in to classes on the same day of arrival. All classes will be capped at 16 spaces. Use the same steps to remove yourself from a class. You may sign up for the week (Monday-Sunday) beginning at 12pm on Sunday. If you sign up for any classes beyond the week you will be removed and will need to sign up again on the appropriate Sunday. As a member, it is your responsibility to sign in every time you come to the gym. If you’re taking class, Crossfit, Olympic lifting, and Gymnastics all included, sign in for that class. If you’re taking two classes in one day, sign in for both classes. If you’re working out during open gym hours, sign in for that as well. If you’re in on Sunday, sign in. If you’re doing private programming, there’s an option for that as well so sign in. You get the idea. Please make sure you have accepted your Front Desk account. You received an email with a link to access this account when you first signed up (or when we first moved you from our old software to Front Desk). If you no longer have this or are not sure how to access your account, visit the front desk next time you’re in this week and let us help you out. You will need this access in order to sign up for your classes. Please email Kelly (kelly@dogtowncrossfit.com) to request your link be emailed to you again. There is a new $5 fee for not signing up/in for class. If you have not signed up ahead of time for a class and there are spots available when you arrive, you must sign in for class. Failure to sign up/in will result in a $5 fee charged to your account. This fee will occur each time there is a failure to sign in. There is also a new $5 fee for signing up for a class ahead of time and not attending. This does not mean you can’t change your mind. You can easily remove yourself from a class in the same way you signed up ahead of time. This is to keep the 16 spaces open for those who wish to come to class. While we are feeling out our new space and how it best works, please be aware that the availability for time and space to complete this outside work will be extremely limited if available at all. We will try to accommodate when we can, but this must be set up ahead of time via email to Dusty (dusty@dogtowncrossfit.com). Every membership has a length of term. You have chosen this length. Any early termination of a membership requires a minimum 30-day notice in writing. This may be accomplished via email to Kelly (kelly@dogtowncrossfit.com). Every early termination is subject to a cancellation fee. This cancellation fee is a minimum of $50 per month remaining on the term. Our combined fundraising efforts have reached $68,948 so far!!! GREAT JOB guys!!! There is still time to collect donation and there is still plenty of time to sign up if you haven’t yet. See three paragraphs down for instructions to sign up. If you would like some assistance getting your page up ad running feel free to contact Julia (julia.furer@gmail.com), Kara (kara@dogtowncrossfit.com), or Kelly (kelly@dogtowncrossfit.com). Any one of these lovely ladies can help you out. 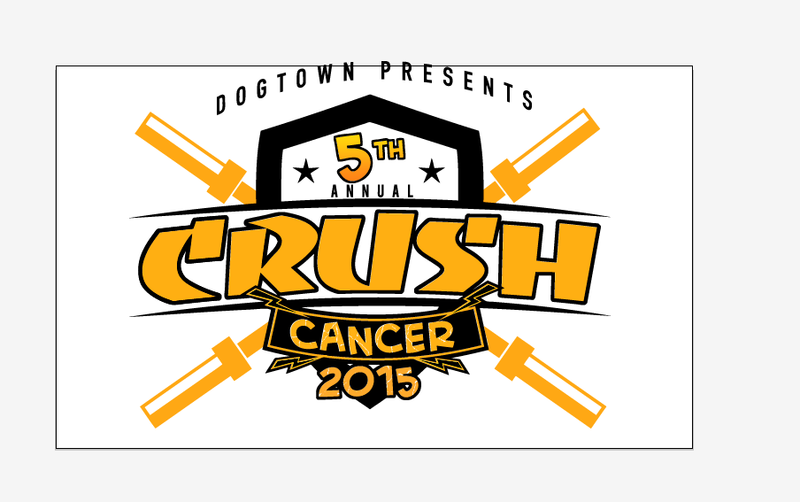 Don’t forget to mark it on your calendars… DogTown's 5th annual Crush Cancer fundraiser benefiting Stand Up 2 Cancer is coming THIS SATURDAY, October 10, 2015! We will be hosting our fabulously sweaty Crush Cancer workout in Downtown Culver City! Make sure you stop by the front desk and fill out one of our “I Stand Up For…” cards so we can add it to the wall. There’s no such thing as too much motivation! We will be assigning heats soon. If you have a time constraint, please email Kara (kara@dogtowncrossfit.com) with what that constraint is BY 5PMWEDNESDAY, OCTOBER 7 and we will try our best to accommodate everyone. If you will be completing the Crush Cancer workout at a scaled weight, please email Kara (kara@dogtowncrossfit.com) BY 5PM WEDNESDAY, OCTOBER 7. Please join the fundraising and help us raise as much as possible. It’s pretty simple to join the team! Visit www.crowdrise.com/CrushCancer2015, create an account (or log in to your account from last year), Click on “Team DogTown” then click “Join the Team.” That’s it. You’re ready to bug everyone you’ve ever met to donate. Don’t forget, most people need to be asked multiple times before they give. Keep at it! Even a few dollars from everyone adds up!!! For those who don’t know… SU2C funds “Dream Teams” of specialists who not only hope for a cure one day, but find a focus in finding better treatments to improve the day-to-day now for those in the battle. They work to develop better medications to lessen the side effects and improve the quality of life during the fight! Monday, October 5, 2015 – Say hello to our new home! Temporary limited class schedule available. Saturday, October 10, 2015 – CRUSH CANCER! Gym is closed all day. Join us in Downtown Culver City (in the parking lot where Culver Blvd meets Washington Blvd) for an amazing event complete with workout, vendors, food trucks, and tons of fun! Register online via the fundraising team on www.crowdrise.com/CrushCancer2015. Sunday, October 11, 2015 – GYM CLOSED -- As in previous years, we will be closed for recovery from Crush Cancer. Rest, hydrate, and get ready for the week! Saturday, November 7, 2015 – DogTown will host the CrossFit Strongman Trainer Certification. For more information and to register visit the Strongman webpage: https://training.crossfit.com/strongman. Saturday, October 17, 2015 – Gladiator Rock ‘n Run 5th Annual Rumble at the Rose Bowl. This event was created by DogTown friend, Dan “Nitro” Clark (Yes, Gladiator Nitro!). It is a 5k mud run featuring obstacles. For more info and to register visit the event website: http://www.gladiatorrocknrun.com/register/10/17/2015. ***Know of a local fitness event/competition/celebration/party/awesome event we should be sharing? Contact Kelly at kelly@dogtowncrossfit.com so we can get the word out! Our scheduled classes have priority for equipment as well as space. Understand that just because you want to do your programming at a certain time does not guarantee you will be able to complete your programming at that time. If the class requires equipment or space you are using, you will need to pause your workout until the equipment/space is free again. We have Open Gym hours that are great for getting your private programming in. Especially be aware that Monday and Tuesday nights at 5:30p and 6:30p and Saturday morning at 9:30a tend to be our busiest classes. Please try to schedule your accessory workouts accordingly. Thank you. Have an awesome or silly picture/video you want to be shared on the DogTown social media pages? Contact Kara at kara@dogtowncrossfit.com. Have a knot, a kink, or just general soreness? Contact our in-house massage therapist, Josh Gilbert at joshuagilbert.massagetherapy@gmail.com. On Saturday September 26th, 2015, the 9:30 and 10:30 will be our last classes at DogTown 1.0 it's bittersweet. The move is very well underway! **DogTowners and guests: We will be CLOSED September 27th(Sunday) - 29th (Tuesday)so we can make the transition as smooth as possible.